It's delicious. 1 of 5-a-day. Suitable for ages 12 months+ to grown ups. Packed with real fruit. No wheat, gluten, dairy, nuts, seeds or egg. No added sugar or salt. No added preservatives. No artificial flavours or colours. Suitable for coeliacs, dairy intolerant and vegetarians.When my kids were little I always looked out for new snacks that they would love munching. So at Kiddylicious I make sure delicious taste is at the heart of everything we create. When I discovered these amazing fruit crisps I thought 'wow'. 1 bag is equivalent to 1 apple. Fantastic! We take the finest apples, carefully take out the pips, then slice and crisp them in a special way to create a crunchy melt-in-the-mouth fruit snack. Kids love them and grown-ups can't resist nibbling a few too! 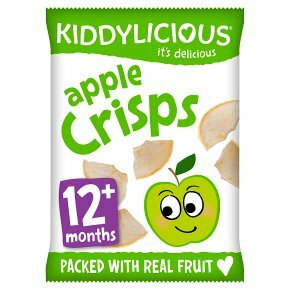 KIDDY CARE: Kiddylicious Apple Crisps are specifically developed for children from 12 months.<br>Always supervise young children whilst they're enjoying them.